You must be a member of the Jakarta Music & Concerts Group to attend this activity. Would you like to join this group? 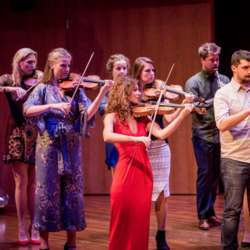 Pynarello is the initiative of violinist Lonneke van Straalen who received the Prix Madeleine Margot in Protected content . This award was created by the société Gavigniès as a recognition of important initiatives and is considered to be the highest prize for innovative musicians in the Netherlands. Pynarello is adventurous, rebellious and flexible. Both musicians and audiences have experienced the performances as very intense. This is not only because playing by heart gives much more flexibility and freedom, but also because playing without a conductor increases communication between musicians greatly. It is this intense experience and unique approach to music and ensemble playing that justifies the place for Pynarello on the Dutch and international stages.